As of SnippetsLab 1.5, you can show the rendered HTML document of your markdown snippets. For some languages, you may find it hard to “guess” the right alias to use. In this case, you can insert the code block by right clicking on the editor and choose Insert Markdown Code Block > (A Language of Your Choice) to let SnippetsLab complete it for you. If the language you want is not included in the menu, you have to enable it in the preferences window. For details, see Active Languages. While both the fenced style and indented style of code blocks are supported by SnippetsLab, you can only specify a language name with the fenced code block style. SnippetsLab can automatically generate a Table of Contents from the markdown snippet and add it into the resulting HTML document. To use this feature, you must explicitly include [TOC] in your markdown snippet. Although technically this marker can be placed anywhere, it’s strongly recommended that it be put in the beginning of the markdown snippet. The marker is case-sensitive, so [toc] will not work in this case. 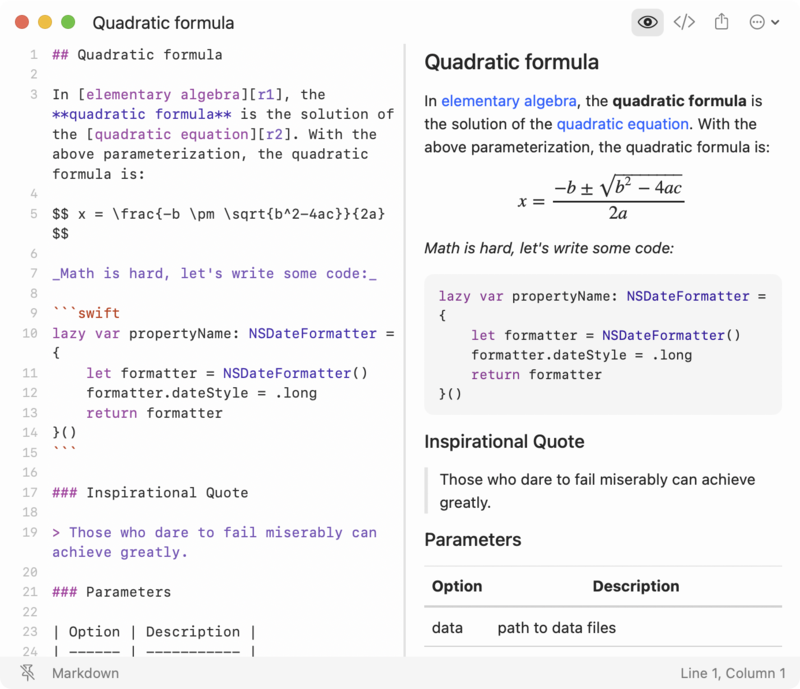 SnippetsLab 1.7 introduces MathJax support which enables users to preview math formulas written in LaTeX. For compatibility reasons, there must be NO SPACES immediately next to the $ inline delimiters. For example, $x$ will work while $ x $ will not (in this case the dollar sign will be treated as a normal character). Choose SnippetsLab > Preferences… from the menubar, switch to Themes tab and click on Markdown to choose and customize your markdown theme. Markdown themes are virtually CSS stylesheets that are applied to the rendered HTML document. There are four pre-installed themes: Bootstrap 3, GitHub, Minimalized and Vector. Edit a theme: Click on the theme you want to edit and edit it directly in the code editor (you can also use your favourite text editor to edit the CSS code and paste the code back into the editor). Changes are reflected in real time. When finished, click the Apply button to apply your changes. You can also click the Revert button to undo all the changes. Add or remove a theme: Click button to add a new theme. Click button to delete the selected theme. Reset all themes: Click button and choose Reset All… to reset all themes. This will delete all your custom themes and restore pre-installed themes. Import or export a theme: Click button and choose Import or Export. Themes can be exported as and import from a CSS stylesheet. The syntax highlighting styles for code blocks will automatically be applied by SnippetsLab on top of the selected markdown theme.